Yam is one of the root vegetables that can be eaten during fasting ... elephant yam and taro roots are very easily available in all North Indian markets , and this time of the year they are displayed on the stalls attractively along with plantains and sweet potatoes which are included in the fasting food list too. I am talking about the zamikand ( meaning underground stem literally ) or the elephant yam . Taro roots or the arbi as it is called in hindi can be processed the same way to make chips. The elephant yam is quite easy to cut into chips if you have a nice sturdy knife and some muscle. Just peel the brown skin and wash the block of yam you are using . Cut in one inch thick slices , again cut the slices lengthwise into 1 inch wide long batons . Now place 2-4 batons together on the chopping board and make as thin slices as you can . I did not click any pictures of the slicing process but you can use a slicer or food processor for your convenience and get nice slices of the yam. So , the square slices of elephant yam or the round slices of taro roots are thrown into hot oil to fry . 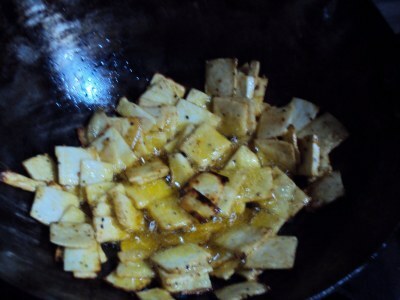 Start with a high flame and then fry the slices on medium flame so that they become dehydrated and cooked while frying . After about 7-8 minutes on medium flame ( if using 150 g of slices for one batch of frying ) the chips become pinkish brown and you can feel the crispiness . Drain on kitchen paper and serve sprinkled with salt ( rock salt for fasting ) and pepper . Red chilly powder and amchoor powder can also be sprinkled if you like. Raw plantain chips can be made the similar way , i make them very often but i cannot upload any pictures right now ( I have to purchase space for that and the process in underway ) and these posts are coming from the drafts. For raw plantains too you have to peel the green skin of the plantain ( which can be made into a yummy chutney ) slice them thinly and fry them directly into hot oil . 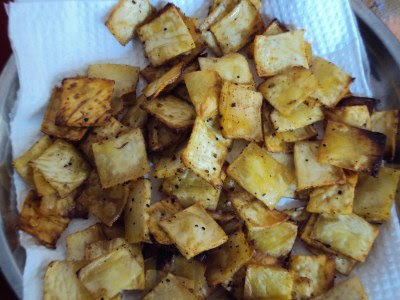 A sprinkle of turmeric and asafoetida water ( 1 tsp of turmeric powder and a pinch of asafoetida dissolved in 50 ml water ) a few times into the hot oil while frying the plantain chips results in nice yellow hing flavored chips. They are great sides for a daal chawal meal served instead of papad . Recently my younger brother loved the plantain peel chutney and plantain chips with a daal-chawal-subzi-raita lunch ...it's so fulfilling to see someone devouring into the food you cook with love. new recipe for me looks yum,. 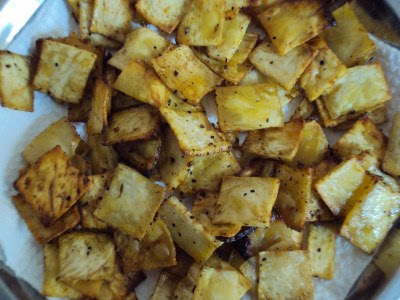 I love yam, plantain chips.. write abt the plantain leaf chutney, I havent heard abt it..
Devasena ...the chutney i am talking about is made with plantain skin ( peel ) and not leaf . The link is given in this post..